Israel's Security Cabinet has ordered the army to step up a ground offensive in Gaza, in a bid to end weeks of Palestinian rocket attacks. Troops have been authorized to move into residential areas and create a buffer zone. Israel says Hamas declared war when it kidnapped an Israeli soldier 10 days ago, reports CBS News correspondent Robert Berger. Israel denies that it is reoccupying Gaza, less than a year after withdrawing all troops and settlements from the coastal strip, but officials say the nation is effectively at war with the Hamas-led Palestinian government. Prime Minister Ehud Olmert convened the urgent meeting after militants from the ruling Hamas group fired a rocket into the southern Israeli city of Ashkelon late Tuesday. Although the attack caused no injuries, it was the first time a rocket has flown so far into Israel, signaling that militants have improved the range of the primitive weapons and escalating a crisis over a captured Israeli soldier. Before the meeting, Olmert called the strike a "major escalation" and vowed harsh retaliation. "There will be steps taken and they will be very serious," said Cabinet Minister Yitzhak Herzog. "There is a very broad operation here. It will continue." An explosion ripped through a metal workshop in Gaza City on Wednesday, killing two Hamas militants, according to hospital and Hamas officials. Palestinian security officials said the blast appeared to be caused by the mishandling of explosives, and the Israeli army denied involvement. The Israel military reportedly thwarted an attempt to smuggle captured 19-year-old Israeli Cpl. Gilad Shalit out of Gaza. According to the Jerusalem Post, an official said that Damascus-based Hamas head Khaled Mashaal was behind the attempts. A Saudi daily based in London, al-Sharq al-Awsat, reports that Shalit's captors rejected mediation attempts by Egyptian President Hosni Mubarak. It also said most of the Palestinian Authority's top officials are in hiding. Participants said the Security Cabinet authorized the army to enter densely populated residential areas, which militants often use for cover to fire rockets. 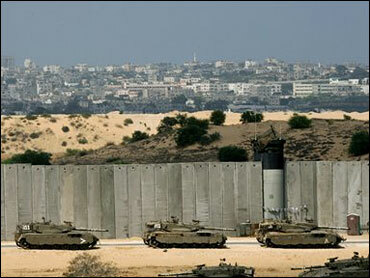 One official said Israel had no plans to reoccupy Gaza. But a second participant said the ministers approved creation of a "security zone" in northern Gaza to prevent rocket attacks, raising the possibility of an extended presence in the area. Israel maintained a small strip in southern Lebanon for 18 years before withdrawing in 2000. Israel launched its offensive into Gaza last week after Palestinian militants kidnapped an Israeli soldier during a brazen attack on a military outpost. The army has been operating in Gaza, but has avoided sending troops into the strip's dense cities. Wednesday's rocket attack changed the equation. "As far as I'm concerned, the (Palestinian) people of Beit Hanoun and Beit Lahiya can start packing," said Zeev Boim, a senior minister in the Security Cabinet. Earlier Wednesday, Israeli aircraft targeted the Palestinian Interior Ministry for the second time in a week, the Israeli military said. Witnesses said missiles hit the main structure and damaged a building next to the ministry. Rescue workers said five people were wounded. Israeli aircraft also fired missiles at a Hamas camp in southern Gaza and a Hamas-affiliated school in Gaza City, and shelled open areas in the north. A 13-year-old boy was seriously wounded in the head by shrapnel, Palestinian medical officials said. The rocket fired by Gaza militants Tuesday flew 7 miles and exploded in the courtyard of a school in Ashkelon, a city of 110,000 on Israel's seacoast north of Gaza. School security cameras showed a large cloud of white dust rising from the point of impact. The school was empty at the time and no one was hurt. Although militants have launched many of the small, homemade rockets in the direction of Ashkelon, this was the first one to hit the center of the city. Militants have repeatedly claimed they were developing rockets with longer ranges. In the hours before the rocket attack, Israeli forces were already operating in northern Gaza looking for tunnels, explosives, weapons warehouses and other facilities used by militants, according to the area army commander. In a sign militant groups were stepping up their activity, soldiers caught a Palestinian militant in the West Bank settlement of Barkan on Wednesday with an explosives belt strapped to his waist and ready for use, the army said. The militant was caught before he had a chance to detonate his explosives, the army said. On Tuesday, Olmert ignored a deadline to free Palestinian prisoners set by the Gaza militants holding Shalit. A spokesman for the Army of Islam, one of the three groups that abducted Shalit, said the militants would not release any information about the soldier until Israel complies with the demands. However, he said there were no plans to kill the soldier. Olmert has refused to negotiate with the militants. On Tuesday, he said he ordered the army "to strike terrorists and those who sent them and those who sponsor them ... None of them will be immune." The threat was clearly meant for Syria, which harbors Hamas' top leader, Khaled Mashaal. Israel holds Syria responsible for Shalit's abduction, saying that Mashaal ordered the kidnapping. Last week, Israeli warplanes buzzed Syrian President Bashar Assad's palace. In Gaza City, Palestinian Prime Minister Ismail Haniyeh of Hamas publicly called on the militants to protect the soldier. "The government is exerting efforts with Palestinian, Arab and regional parties to end this case in the appropriate manner," Haniyeh said at a Cabinet meeting.